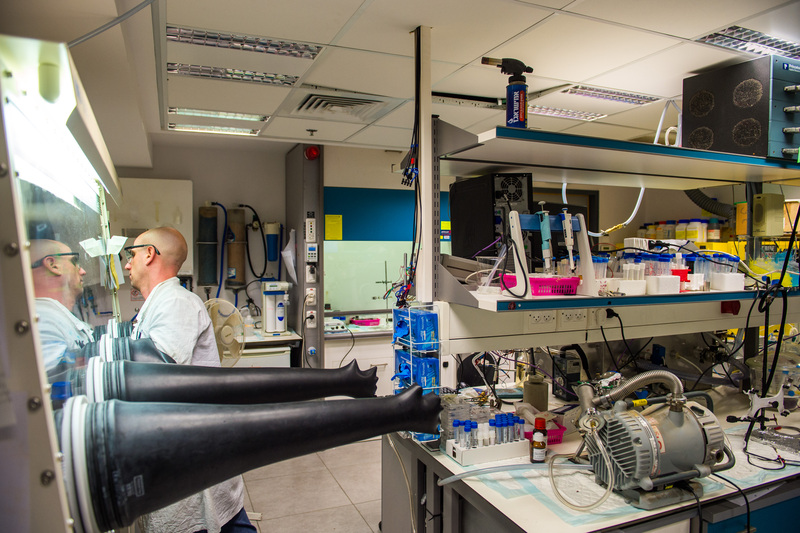 The Leona M. and Harry B. Helmsley Charitable Trust Energy Storage Complex at the Technion, established by the Grand Technion Energy Program (GTEP), is a thriving international research hub for pioneering the batteries of tomorrow. The research focus at this state-of-the-art facility is on developing metal-air batteries (Al, Li, Zn, and Mg), advanced Li-ion batteries, as well as other novel technologies including silicon-air batteries (Si-air), environmentally-friendly devices with a potential to provide autonomous power for silicon-based devices. Activities at the Helmsley Energy Storage Complex are multidisciplinary and range from fields exploring electrochemical activity in ultra-capacitors, to electrochemical assisted photo-catalysis, thermal solar applications and spectral analysis of fuel cells. At the facility, scientists work at its four central hubs: the powder preparation hub (with high temperature ovens, milling equipment, drying ovens and press to support dry synthesis of battery active materials), wet electrochemical/chemical laboratories (with glove boxes, hoods and electrochemical equipment), battery discharge and characterization hub (with spectroscopy tools including Micro-Raman and FTIR), and the X-ray diffraction lab (with a sophisticated X-ray diffraction system). Technion’s Helmsley Energy Storage Complex serves GTEP members as well as faculty from other Technion departments, Israeli academia and industry. Over the past academic year, several international students have come to the facility to conduct research on advanced energy storage topics. > Multipurpose X-ray Diffraction System used in the identification and characterization of compounds based on their diffraction pattern. > FTIR Instrument The ALPHAis an extremely compact FT-IR spectrometer with rugged and intuitive design. This state-of-the-art system ensures accurate and precise results within short measurement time. > Battery Tester (by Arbin Instruments) A multiple independent-channel testing system mostly used for the lithium-ion batteries characterization in MSAL. > TFS 200 ALD System Is among the most flexible ALD research platforms available. With the TFS 200, the freedom of coating and application development is placed completely in the hands of the operator.